The challenge has been revealed. Late last year, former Wimbledon champion Roger Federer asked his Twitter followers what sport they would like to see him compete in, other than tennis, and with whom. The champion skier, Lindsey Vonn, took the bait and responded. After several teasers, on July 16, the challenge became public. 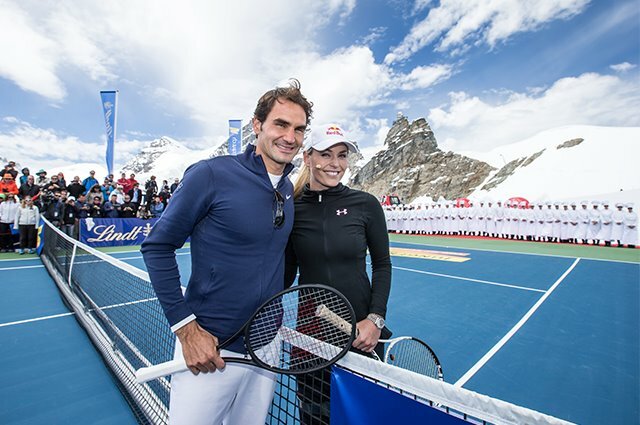 Federer was mum about the event when Skypeing Vonn about the challenge, only drawing a picture of a mountain and stick figures, representing the two athletes, at the top. The original conversation, although teased on websites on July 12, took place a few days before. With the support of Lindt, who promised fans would find out more by following the hashtag #ChocolateHeaven, the secret was revealed atop Jungfraujoch, a glacier 3,454 m above sea level in the Bernese Alps in western Switzerland, on July 16 at 1.23 p.m. European summer time. 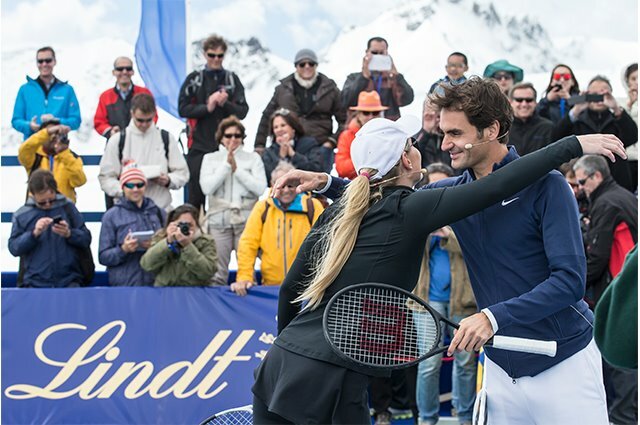 A tennis court was set up among the snow and ice, where Federer and Vonn played an exhibition tennis match to promote the Lindt Swiss Chocolate Heaven shop, the highest Lindt chocolate shop in the world. But the pair did play by themselves without the staff and press present for a piece of Lindt chocolate. For the exhibition game, Federer played a relatively relaxed game allowing Vonn, who was at point joined by two children on her side of the court, though the Wimbledon pro did give one serve in his usual style, which stunned the skier. And, as expected, both sports stars went on their social media accounts to Tweet, Facebook and Instagram the event to their millions of followers. As a promotion, the reach was international—and we can’t wait to see if these two real-life friends will get another challenge in due course.